There are many significant stories surrounding the celebrations in the month of Karthigai. 1. Moon got married to the 27 daughters(Ashwini to Revathi) of Lord Daksha; Moon showed special love for Rohini.The father got annoyed but Moon did not take notice. The father cursed the moon to wane. Moon started shrinking slowly; Moon then prayed to Lord Shiva, he fasted and did pooja. Shiva pleased by his fasting and poojas, allowed him to wax again, kept the crescent moon on his head, and he is called Someshwar (Soma means Chandra or Moon), Chandrasekhar, one with a crescent moon on his head. Kartigai Somawaram started from this legend, and people follow this to get the blessings of Lord Shiva. 2.In this month Lord Shiva destroyed the three cities of Thiripura Asuran(demon king). 3. The planet Mars rules this month Karthigai.This planet's ruler is by Lord Subramanya or Lord Muruga. Parents name the children Subrahmanyan because of their devotion to Lord Murugan. He is also called Karthigeyan. He is Shiva’s second son. He came out of Shiva's 5 faces (some add another one ).The five faces are Tatpurusham, Agoram, Sadyojatham, Vamadevam, Easanam and some call the sixth as Sakthi. From his third eye a droplet of fire fell on a pond and this became a six-headed baby. This baby is raised by celestial nymphs called Karthigai pengal (young women). Shiva Parvathi merged all the heads to become one. Shiva therefore became, Soma Skandar. 4. Early literature or legend states both Vishnu and Brahma were fighting, both claimed that he is the greatest. They went to Shiva who became a huge fire and asked Vishnu to find the feet of the fire pillar and asked Brahma to find the head of the fire pillar. Brahma took the form of annam-a swan, Vishnu became a boar, both were not able to find the head or feet. Vishnu accepted his inability. but Brahma lied to Shiva that he has seen the head, and he said a flower called thalampoo is the witness. Shiva immediately realized that he is lying and cursed Brahma that there should not be any worship or temple for him. During Shiva pooja, thalampoo is not used. However, there is a temple (Brahma Puriswarar temple) near Thiruppathur very close to Trichy and Pushkar near Jaipur were people worship Brahma.The Thiruppathur Brahma according to legends and actual feedbacks can change a man's or woman's fate by keeping his horoscope under his feet. It is said that Ambanis are regular visitors to this temple. 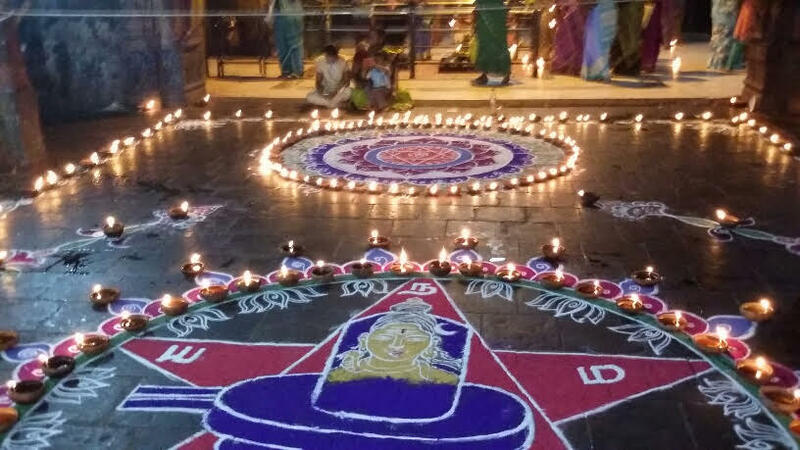 5 Now coming back to karthigai deepam, it is an extension of Deepavali Agananuru, Sangam literature, chilpaathikaram all quotes about Kathigai deepam in Tamilnadu (200BC).Earthan lamps called agals are lighted near Shivas sannidhi, in front of the temples inside and outside the house during the night. Agal lamps ward off evil, analogous to the Raki used in north India. Karthigai star falls on full moon day. Early in the morning 1008 times sankabishekam is performed in Shiva temples on on Shivalinga in karpagraha. (Sanku is a conch).The reason is to remove “Dosham”, bad omen, etc. Puranas states those who observe the fast on this day will be like Arundhathi and Vasishta in life. .
6 Karthigai Deepam in Annamalai hills in Thiruvannamalai: Karthigai full moon or Karthigai Pournami is unique to both Shiva and Vishnu temples. On this day karthigai deepam is lighted.There is a special lighting ceremony at Thiruvannamalai Arunachlewarar temple and the nearby hill. A special lighting ceremony is conducted every year at the Arunachala hills which is near Sri Arunachaleswarar temple.3000Kgs of clarified butter- ghee, and 1500meters of white cloth for wicks(thiri) are used to make this elephantine lamp. A ceremony will be conducted at the temple and again in the hills before lighting the lamp, and this fire will be visible to many miles. In all Shiva and Vishnu, temple priests burn chokkapanai. Chokkapanai is nothing but a broad pole covered with dry palm leaves. Dry palm leaves are gathered, the leaves will be tied to a dry palm tree trunk or in wooden poles.The temple priest will do Karpura arathi, will do pradakshinam and he will light the chokkapanai. They thus perform a small-scale Annamalai deepam. .
7 What is the significance of lighting a lamp : my mind is full of ego and I remove this by looking at the light of the lamp. One must remove his arrogance and ego by looking at this lamp. You do not see anything in a dark room, when you switch the light on we look at all things. .
8 Pradakshinam around Annamalai hill(14km): This is carried out during the month of Karthigai and other months on a full moon day, some do on new moon days or other days depending on your arrival .Pradakshinam without foot wear during Karthigai is very sacred(this is a must).This pradakshina, the act of going around the hill is equal to going around the world by foot, with Shivalinga in the middle. You will find many Shivalingas during this walk. It is sadi that Manikavachakar a Tamil saint stayed in a village called Adi Annamalai and here Lord Shiva appeared before him and granted the saint the divine outpouring of Thiruvembavai-the sacred chants of Lord Shiva.At the very place, there is a temple called Manikkavachaka temple; the temple is full of nayanmars and Shivalinga. Recently a festival was conducted for the four saints, all musicians from Tamilnadu attended the festival including politicians. Pradakshina-or giri valam of Annamalai hills according to Sri Ramana Maharishi, removes all problems, Pra=removal of sins,da=fullfilling desires,rsha= freedom from future births,na=giving deliverance.He will go round the hills few times a year.When a person asked Maharishi a Vedic text for him to read, he suggested to do girivalam; he said you would lose dehtama buddhi i.e. body conscience.Such is the wonder of Annamalaiyar and Girivalam. 9 Karthigai is also the month Iyappa mandala pooja begins in Kerala and the rest of India.Devotees observe a strict pooja rituals for 41 days. .
Women should the following sing when they light the lamp. Deepamangala Jyothi Namo name Deepa sathyathe sarvam sandhya Deepa namosthuthe. I prostrate at dawn and dusk, the light of this lamp is knowledge and God, please remove my jealousy, hatred, and ignorance. Please help me, God. .